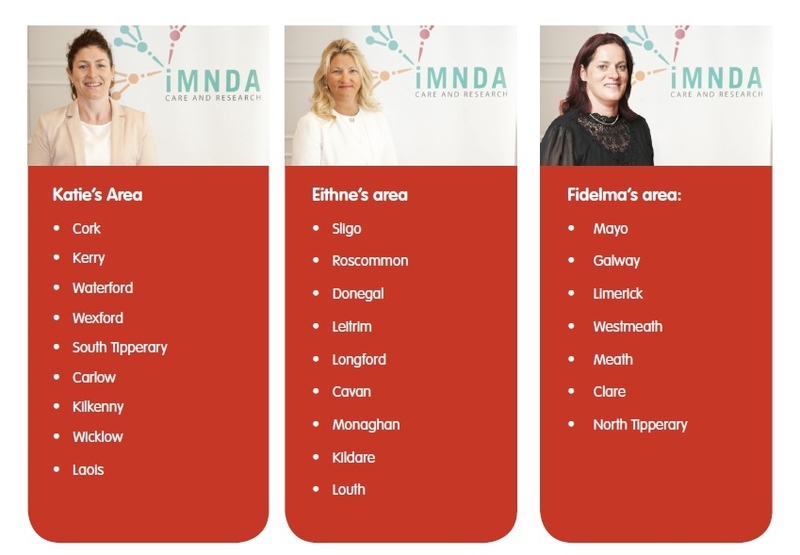 Eithne, Katie and Fidelma are the IMNDA nurses, who work alongside the IMNDA and consultant neurologists throughout the country. As well as attending MND clinics, the nurses travel throughout the country providing nursing support to people who have been diagnosed with MND. They provide support to their families and carers by means of home visits, a help line and on-line contact. All three nurses have a vast level of experience working within the field of neurology and all three previously worked together on a neurological ward in Beaumont hospital. Being nurses that specialise in Motor Neurone Disease means they play active roles in both patient and health care professional education to ensure the highest level of patient care is being delivered at all times. The nursing service is active in its total approach to care, embracing physical, emotional, social and spiritual elements. It focuses on enhancement of quality of life for the client and support for the family and includes the management of distressing symptoms and provision of support and care throughout the journey of MND. The MND nurses are central to the patient and family. They are also vital for links out to all of the services and health care professionals. They endeavour to co-ordinate a service that provides continuity of care for a case load of patients in collaboration with local health care professionals and carers, especially those with specific palliative care needs. The role applies to acute and community care settings. The nurse’s act as an informed resource for health and social care professionals, involved in the care of the clients living with MND. The nurses have designated areas to ensure a continuity of care and equitable service throughout the country. Dublin is shared care by the three nurses.